So about an hour ago, I was looking for the Contra III OST. I downloaded it an realized that the name of the song that plays in the background is called 'Neo Kobe Steel Factory'. (Link to the song https://www.youtube.com/watch?v=_qjnTfCJqqw). 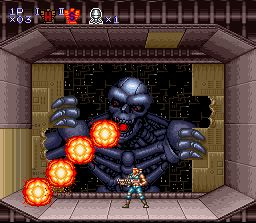 And then it clicked, the boss of level 3 in Contra III is a giant Snatcher! He even shoots beams from out of his mouth! Crazy coincidence isn't it!